SINGAPORE - Singapore exporters ended 2017 on a muted note after a year of surging growth, with shipments coming in way below expectations in December. But for the whole of 2017, growth came in at its strongest pace in seven years on the back of robust global demand for tech products. Non-oil domestic exports (Nodx) grew 3.1 per cent in December, undershooting economist estimates of an 8.6 per cent rise and also much slower than the preceding month's 9.1 per cent increase. 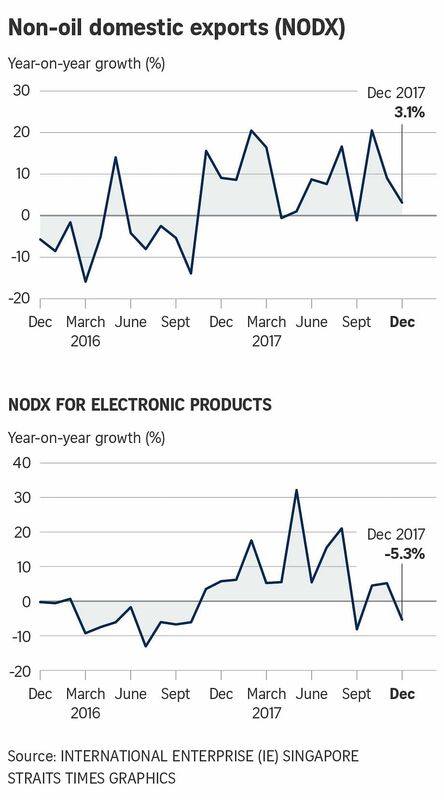 This came as electronics exports - a key growth driver for the economy over the past year - declined 5.3 per cent over the same month a year earlier. Non-electronics shipments made up the shortfall, rising 6.8 per cent. Nodx to Singapore's top 10 markets went up, with the exception of Hong Kong, Taiwan, China, Thailand and Indonesia. The largest contributors to the Nodx increase were the European Union, South Korea and Malaysia. In a note, OCBC Treasury Research pointed out that Nodx to China, Singapore's largest export market, also dipped 6 per cent in December. "This bears watching to see if the December slump to China is a seasonal blip." For the whole of 2017, Nodx grew about 9.2 per cent, taking into account the latest December data. This was the strongest pace of expansion since 2010 and also blew past official forecasts. Trade agency IE Singapore had tipped Nodx to rise 6.5 per cent to 7 per cent for the full year.